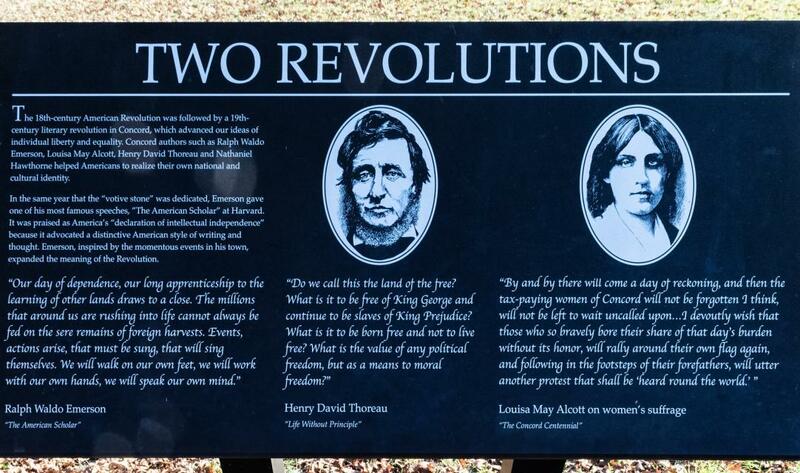 The 18th-century American Revolution was followed by a 19th-century literary revolution in Concord, which advanced our ideas of individual liberty and equality. Concord authors such as Ralph Waldo Emerson, Louisa May Alcott, Henry David Thoreau and Nathaniel Hawthorne helped Americans to realize their own national and cultural identity. In the same year that the "votive stone" was dedicated, Emerson gave one of his famous speeches, "The American Scholar" at Harvard. It was praised as America's "declaration of intellectual independence" because it advocated a distinctive American style of writing and thought. Emerson inspired by the momentous events in his town, expanded the meaning of the Revolution. "Our day of dependence, our long apprenticeship to the learning of other lands draws to a close. The millions that around us are rushing into life cannot always be fed on the sere remains of foreign harvests. Events, actions arise, that must be sung, that will sing themselves. We will walk on our own feet, we will work with our own hands, we will speak our own mind." "Do we call this the land of the free? What is it to be free of King George and continue to be slaves of King Prejudice? What is it to be born free and not to live free? What is the value of any political freedom, but as a means to moral freedom?" "By and by there will come a day of reckoning, and then the tax-paying women of Concord will not be forgotten I think, will not be left to wait uncalled upon . . . I devoutly wish that those so bravely bore their share of that day's burden without its honor, will rally around their own flag again, and following in the footsteps of their forefathers, will utter another protest that shall be ?heard round the world.'" This marker can also be identified by its HM code. You can use the hashtag #HMUF6 in tweets, and any other place where you might refer to this marker, including when searching on this site.